(17/P107) TRENTON – Deputy Commissioner David Glass joined 52 DEP employees to harvest vegetables, tidy gardens, and spread mulch as part of a volunteer effort undertaken in partnership with Groundwork Elizabeth to prepare community garden plots in the City of Elizabeth, Union County. The group gathered Friday, October 27 to prepare individual gardens at the Elmora Community Garden behind the Elmora Branch Library, 740 West Grand St., Elizabeth, for winter, so the gardens will be ready for spring 2018 planting. The event marks the fourth time since 2016 that DEP employees have worked with Groundwork Elizabeth to prepare gardens and help cultivate healthy produce for urban communities in Union County. DEP volunteers harvested tomatoes, sweet peppers and planted garlic, raked the gardens, prepared them for spring 2018 plantings, and tidied the property during the daylong volunteer effort. 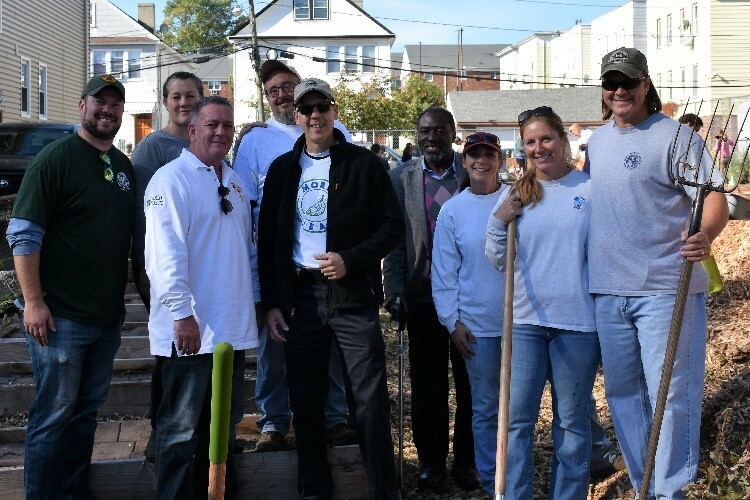 They also spread more than 35 yards of wood mulch over the entire community garden and around 50 planting beds, prepped 28 raised beds, and cleaned food-safe plastic containers. In addition to the garden work, the employee volunteers insulated a wood-frame learning center with denim insulation. The denim is an all- natural green product made from denim scraps and cotton that provides the same R value as standard fiberglass insulation. DEP in 2016 awarded $250,000 to Groundwork Elizabeth’s Come Grow With Us! 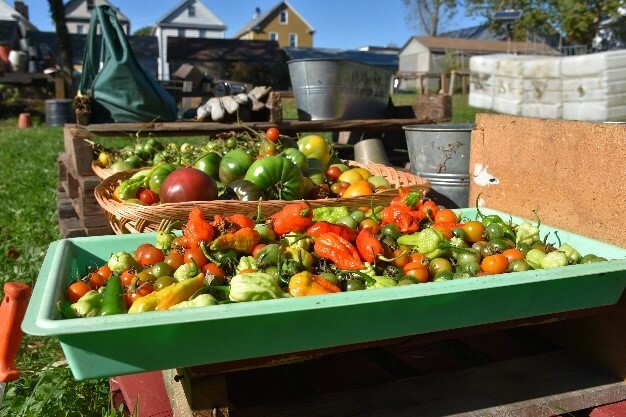 Community Gardening Program to improve access to healthy foods, develop ways to build sustainable agriculture systems, and create “green”-focused career opportunities in Elizabeth and surrounding urban areas of Union County. Groundwork Elizabeth works to meet those goals through a Permaculture Education Agricultural Systems (P.E.A.S.) program, which is sponsored in part by DEP. The program, overseen by the DEP’s Department of Environmental Justice, brings together government partners, the private sector, faith-based organizations, community-based groups, local educators, and the community to develop a local system for sustainable foods to help offset food deserts. It also helps combat rising obesity rates, declining health indicators, and increasing costs related to food production and transportation. The Groundwork Elizabeth program is an outgrowth of the Groundwork program founded in England in 1979 to involve the community, public and private sectors in addressing urban community challenges. Groundwork Elizabeth promotes economic and social well-being in the Elizabeth area through several community-based partnerships to empower residents, businesses, educational institutions, and other organizations that work to improve quality of life.